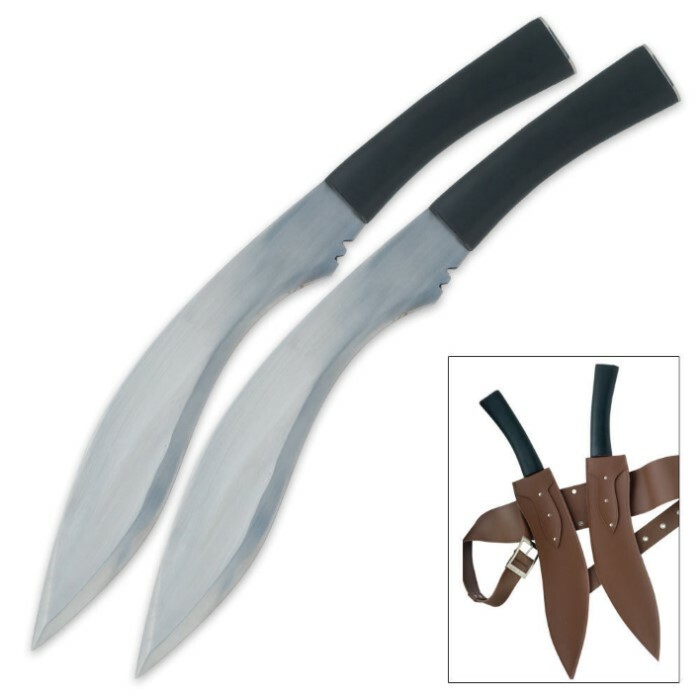 Alices Undead Extinction Kukri Machete Set | BUDK.com - Knives & Swords At The Lowest Prices! Whether you are a super human bio-designed warrior, or an angry gardener, these wicked blades will take care of your worst nightmares. I got them for trainers, I will say its what I expected. I have seen some reviews about the knives not having an edge...It says in the add there is no edge and that is why I got them. For use as training knives you could not do better! As far as a useful knife, completely worthless. The metal is soft and will not hold an edge, the sheath is the most oddest design you could imagine. However they are weighted well and respond well. If your an advanced knife fighter and looking for a way to become a better Fighting Kukri. They are the best trainers you can get!! I bought these as a gift for a close friend of mine and I could have definitely done better. Even considering the price I was underwhelmed. not full tang,awkward sheath design, and the most pitiful edge I have ever seen on a blade. Maybe you could justify buying these if you wanted to reenact your favorite resident zombie movie. But for those of us who would buy this type of knife to use it as a tool and not a prop, I would recommend continuing your search. Maybe for something a little smaller, thicker, and with a non slip handle. I was very happy when I pulled the Kukhri's out of the box. the belt is made of new leather and needs to be worked abit so it gets looser and you can sheath it faster. They where very dull but after some sharpening they work very well. These look great. Don't get me wrong. I am not unhappy about these. The sheath is comfortable. A little awkward but not horribly so. The blades are where I have an issue with these. They did not come with an edge. I'm not saying they were dull. I'm saying they were never sharpened to begin with. The steel is still squared off across the entire edge of my blades. It is possible to sharpen it but its going to take a long time and be quite a hassle. I can't give these more than a 3 star review because despite the display quality the blade position is not adjustable with the sheath which make sit difficult to deploy both blades at once. The leather is not high quality, and the blades have never had even a slight edge put on them. Worth getting. But for practical use this is a project blade. well I got those and really I have three things to say about them. 1) The belt sheath for the blades is awesome and well constructed. 3) Blades are well made but not sharp AT ALL.....The edge is so dull I could run it across my arm without fear of ever breaking the skin. All in all, everything was well constructed, but I just would have preferred sharp blades. Dullest Blade I've handled so far if I'm lucky I can cut through mud also sheath is awkward at the waist more when blades are in the front and when there in the back much harder to access...at least they look really cool. Ok, so first of, these are awesome, truly a great buy, you get two knives, witch are about 20in long, the blade is about 13 itself, they are huge. in addition it does come with a nice leather sheath, but its a little awkward to grab from because they on you back as a posed to your sides. the sheath isnt held togeather by much also. and another thin is these are half tang swords, so there not exactly ment for cutting down trees, and the blades come with no edge at all.